Seven score and twelve years ago today at 7.22am, Abraham Lincoln died – nine hours after an assassin’s bullet entered the back of his head. 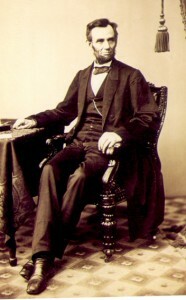 This self-educated, rough-hewn lawyer from Illinois with virtually no administrative or military experience had for four years led a divided nation through its greatest constitutional, moral and military crisis – only to be slain a mere six days after Robert E. Lee’s surrender at long last brought an end to the American Civil War. “Now he belongs to the ages,” the Secretary of War Edwin M. Stanton famously said at Lincoln’s deathbed, and indeed America’s Redeemer remains the nation’s greatest hero – an almost mythological saint. But perhaps the greatest tragedy of Lincoln’s martyrdom is that he did not live to finish the job. In his extraordinary Second Inaugural Address just one month prior (701 perfectly crafted words: he was a literary genius), the narrowly re-elected president set out his vision for his second term as Union victory edged ever closer. The “scourge of war,” he reasoned, was divine punishment for the sin of slavery, a sin in which all Americans – Northern as well as Southern – were complicit. But if America was to be reborn, there must now be compassion and reconciliation. With his customary patience, shrewd calculations, careful timing and iron resolve, Lincoln planned to forgive the South, help it rebuild and bring it up to speed with the more industrialised North. When he died, however, Reconstruction was taken over by Radical Republicans hell-bent on punishing the impudent former Confederates. They ended up driving a Treaty of Versailles-like wedge between the North and South, creating an alienation that led directly to Jim Crow and 100 years of discrimination and segregation. Lincoln wasn’t without fault. His critics are quick to quote his racist remarks in the 1858 debates with Stephen A. Douglas, and remind us that his initial objective in the civil war was not the issue of slavery but to save the Union. By 1863, however, Lincoln was as convinced as Frederick Douglass that America could only become its idealized self with the abolishment of slavery – and midway through the war he boldly issued the Emancipation Proclamation. He genuinely came to believe that “all men are created equal,” and carried these democratic ideals through to their logical and constitutional conclusion. He is universally acknowledged as America’s greatest ever president, and it would be difficult to argue otherwise.